Break Charity have been holding their annual Grand Norwich Duck Race since 2012 and following its success this year the characterful oversized plastic ducks will be paddling down the River Wensum again in 2016. 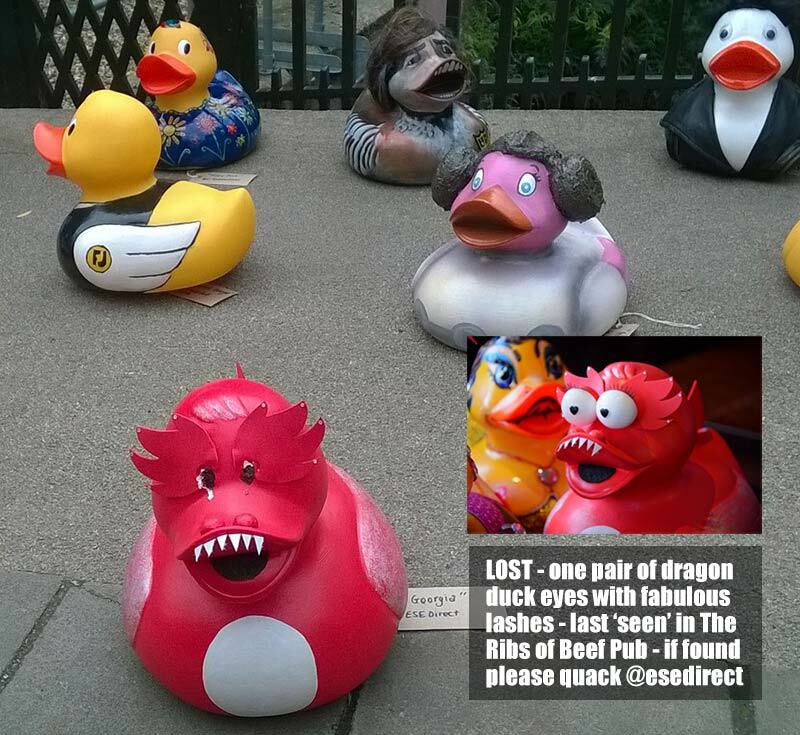 We decided it was time to get out our waders and take up the challenge of creating an eye-catching duck of our own, a friend for George our resident dragon, we named her Georgia. Here is her duck into quirky little dragon-duck transformation. We escorted Georgia to the Ribs of Beef Pub, sponsors of the race, where she was warmly welcomed by the publicans and visitors alike. She was a little nervous at being left alone but it didn’t take her long to get settle in and make friends, Dee Dee Luscious and The Fabulous Duckettes quickly took her under their wings. Martin and Julie attended the race and were cheering Georgia on. It quickly became apparent that she’d had a little accident. Bless, she lost her eyes! She didn’t do very well in the race, unsurprising as she couldn’t see which direction to swim! Duck QuakEnroe winner of last year’s race maintained his crown and swam across the finish line ahead of all others, what an aerodynamic afro he must have! You cannot be serious! He’s proudly sponsored by Ashton KCJ Solicitors. Fortunately Sarah Bunn, Senior Fundraising Officer at Break located eyes casually rolling around by Fye Bridge and looked after them and Georgia until I was able to administer some much required TLC! Restored to her former glory it was time for Georgia to join the line-up and go under the hammer at the charity duck auction. It was held at the stunning Maids Head Hotel in Norwich which was built on the site of the home of William the Conqueror over 800 years ago, which gives it the title of the oldest hotel in the United Kingdom. A total of fifty-six designer ducks were up for auction featuring Geese Lightening, Woody Duck, The Dulk, Alan the Partridge, Duck in the USA and Paddington Duck. The evening was expertly run by auctioneer extraordinaire, Elliott Symonds. Georgia raised a quackingly good £70 with her sparkling friend Duck Bling making an incredible £550. All proceeds go to Break and through them, change young lives. Collectively the ducks auctioned totalled a whopping £5500. We miss Georgia but are glad to hear she is very happy in her new home with Catherine Dorrell. Keep an eye out for our floating friend on the river on Sunday Aug 28th 2016, you never know he or she may be top bill!